Before 1900's almost all of Sortavala was built of wood, and Turunkatu (Turku street) was no exception. Practically all of its wooden houses were destroyed in 1904 by a huge fire, and it was not until the start of the 1920s, that new buildings were rather quickly erected on this street. The possibility of buying a “vacant” lot in the downtown attracted quite a few local businesses, and the Saving Bank of Sortavala was among them. The very idea of saving banks as a mean to socially assist the poor was accomplished in Hamburg in 1778, and similar banks started to spread around Europe. The first such bank appeared in Finland in 1823. Its charter proclaimed: “We are pursuing the goal to create a possibility for low paid workers to save money safely and at no extra costs thus contributing to awake in them a desire to save and prosper.” As the industry in general thrived in the second half of the XIX century, saving banks, with their functions substantially extended, kept appearing in Finland. By the year of 1870 there were 22 banks in towns and 11 – in villages. 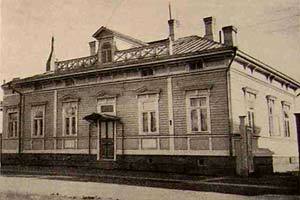 A similar bank was founded in Sortavala in 1873 and had several wooden houses all around the town. 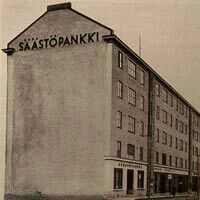 For instance, starting from 1913, its office was situated in the Municipal Counselor K.Nissinen house on Karjalankatu (Karelian street), although already by the end of 1920's the bank had been lacking space. The bank management then decided to acquire the above mentioned lot #12a which belonged to the town, in order to build offices there. The holding company Sortavalan Keskus has been created by the bank, and the Veljekset Kivinen firm, which owned the neighboring lot #12b, became one of shareholders. The company decided to erect a modern five-story building where lower stories would accommodate bank offices and the higher ones – dwelling apartments. The blueprint of the building was commissioned in 1929 to a famous Vyborg architect Uno Ullberg, already in the beginning of the twentieth century renowned for buildings designed and constructed in national romantic style. Among those were buildings of the United Bank of the Northern Countries (1913) and that of the Finnish Bank (1915). Uno Ullberg graduated from Helsinki Polytechnic Institute in 1897. Shortly before graduation he and some of his fellow – students were awarded a state grant in ancient Karelian architecture research. The result of the research was their book written on their travels across Finland and Russia and entitled “Popular Wooden Architecture of Karelia”. Besides, Ullberg studied French and Italian architecture. He designed schools, banks and sanatoriums. 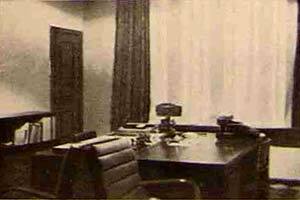 Being Vyborg Chief Architect from 1932 to 1936 he left considerable architectural heritage in this town. Among his most famous works are the Art Museum and Art School complex, several administrative buildings and the Round Tower reconstruction design. By the end of the 1930s, Ullberg created Helsinki Medical University complex which included a hospital, a clinic for children and an education center. His last work, erected in 1940, not long before his death, was the Bensow Business Center in Helsinki. 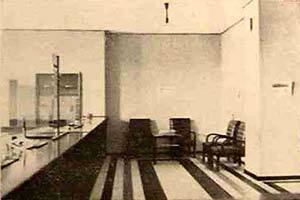 The 1920s were the period of functionalism (also known in the former USSR under the name of “constructivism”). This trend consisted in abandoning superfluous decorations which was proper to the modern style, omnipresent at the beginning of the twentieth century. Functionalism quickly became popular in Finland and undoubtedly influenced Ullberg as well, although he tried to add some particularities to his buildings design. The example is the Saving Bank in Sortavala: regardless of general ascetic appearance of the building, its façade belongs rather to neo-classic style. 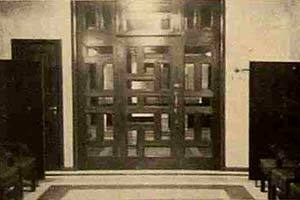 Attention is attracted by a peculiar “panelled” ornament on both sides of doorframes, the patterned wooden door and the overall painting of the building. The interior part, however, belongs to a functionalistic style mentioned above. Construction of the five-story structure was finalised in 1930. The Saving Bank was quartered on the first floor, the ground floor was occupied by the archive, the conference hall and service rooms. 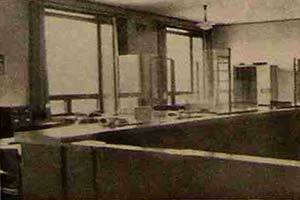 Ullberg also designed bank furniture which was manufactured by “Helylä” holding company. The Bank invested some 465 000 marks into the edifice construction. After the Word War II Soviet “Gostrudsberkassy”, transformed nowadays into “operational part of the Saving Bank Branch N 6638” inherited the building. Its interior was remade many times, and the last vestige of the past was a bulky and heavy Finnish-made safe which keys were lost long ago. In 2004 it has disappeared in its turn during a renovation. This year the town of Sortavala has finally found money to paint the decayed façade.